As promised yesterday, we're going to review the BotCon Animated figures. But since they all share molds with things we've already reviewed, we're just going to review what's new: namely, the paint apps and the head sculpts. And of course, the personality. The dark and dreary Dead End believes in nothing beyond the sheer pointlessness of existance. His nihilistic world view drives him to perform increasingly dangerous stunts in pursuit of even a fleeing thrill. He has been known to throw himself into the line of fire. Theatrically morose, he considers his Autobot shell the height of ironic fashion and composes poetry so bleak as to be farcical. His mini-bazookas are nigh-undetectable when stowed. Ah, Dead End - the deeply depressed member of the Stunticons. Because nothing says "teamwork" and "member of a high-octane stunt show" like a raging nihilist. You really want to put your spark in the hands of the guy who thinks all life is meaningless and doom eventually comes to us all. Dead End uses Jazz's body, which is not without precedent: in the G1 Season 2 episode "Masquerade," five Autobots go undercover as the Stunticons, and Jazz was the one chosen to stand in for Dead End. Why? Because they both had Porsche altmodes. It certainly wasn't based on personality! The body is done in a nice burgundy color, and the offset yellow and white stripes are placed perfectly. 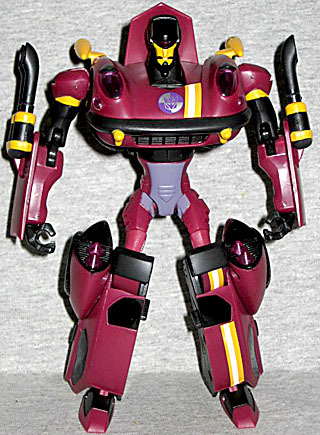 He has the Stunticon logo right on the center of his chest, and though there aren't a lot of connections to the old G1 robot mode, his face is golden, so there's that. While most of the Animated Stunticons get new heads, Dead End doesn't. He just uses Jazz's "cool cat" noggin, though it's been repainted with a silly little mustache. Apparently the idea for him was to be a typical emo French poet, but David Kaye instead voiced him in an unchanging monotone - so basically, like a robotic version of Eeyore. Funny!